Meals are prepared according to the local tradition of simple and genuine dishes. 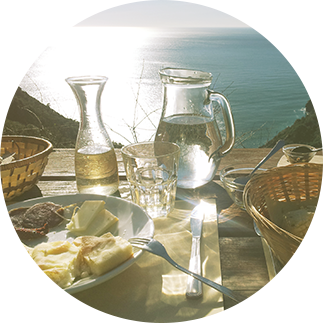 The Cooperative provides fresh produce, olive oil and herbal liqueurs from their own garden, bravely grown on the typical terraced slopes of Liguria. Other small local partner companies provide wine, craft beer, olives and organic meat. Bread is home baked daily. a lighter meal at 22€ inclusive of mixed starters plate and one other course of your choice. Water and bread are always included. A unique setting, wild and exciting. Oil honey and herbal liqueurs Hospitality in an old mill the farm for walkers.